Officers arrest non-Hindu to hide religious motive for attack, sources say. 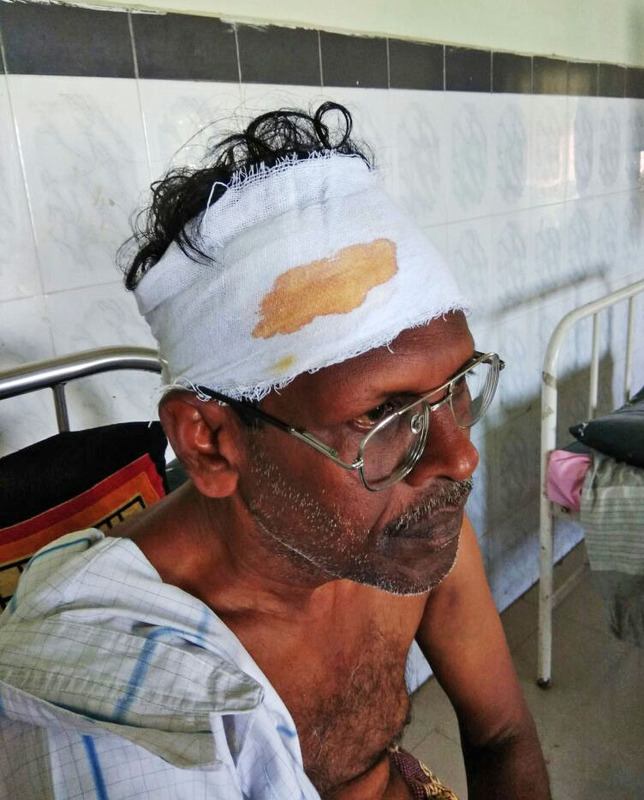 HYDERABAD, India (Morning Star News) – Hard-line Hindus used steel rods and a butcher’s knife to attack a father-son pastoral team in Tamil Nadu state, India, injuring the brain tissue of the elder clergyman, sources said. In Thyagaraja Nagar, in the Sirkali area of Nagapattinam District, 28-year-old pastor Daniel Jebraj was returning home on July 19 at about 7:45 p.m. when he noticed five men drinking alcohol, smoking and ridiculing Christianity in front of his church gate, he said. As they struck with the knife, wooden sticks and steel rods, his 61-year-old father, pastor Muniyandi Elangoan Jebraj, rushed out to help him. 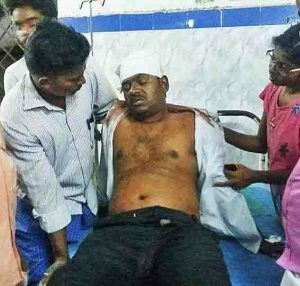 Christians identified the assailants as members of the Hindu Makkal Katchi, a wing of the Hindu extremists Rashtriya Swayamsevak Sangh (RSS) in the state. The elder pastor received a CAT scan of his head at Sirkali Government Hospital in Nagapattinam District. 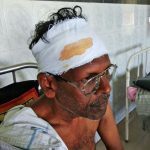 Dr. Pon Rajendran told Morning Star News that the two pastors suffered injuries from repeated battering with a knife, wooden sticks and steel rods. Elangaon Jebraj was referred to Nagapattinam Medical College to consult a neurologist for further treatment. Superintendent of Police Abhinav Kumar told Morning Star News that a First Information Report (FIR) was filed against two people, and that they appeared in court and were sent to judicial custody, but Daniel Jebraj said only one suspect was arrested plus an innocent young man who took no part in the beating. Kumar denied the religious motive for the attack. Of the five assailants, police arrested a Hindu identified only as Hariharan and an 18-year-old Muslim, Mhamadhu Abdullah Barish; the latter took the pastors to the hospital, Daniel Jebraj said. Sirkali police filed charges against both men of causing hurt by dangerous weapons (punishable by up to three years in prison), criminal intimidation with threat to cause death or grievous hurt (punishable by up to seven years in prison), and uttering obscenities near a public place. The district vice president of the Tamil Muslim Munnetra Kazagham, a group working for the progress of Muslims, agreed that Barish was falsely accused. Barish, now held at juvenile detention facility, and his widowed mother live in a predominantly Hindu colony close the church premises. The Hindu Makkal Katchi have been aggressively inciting Hindus in Tamil Nadu to attack Christians, sources said. Previously active only in the Kongu belt comprising the western part of the Tamil Nadu and parts of the states of Karnataka and Kerala, they now have spread to the rest of Tamil Nadu, a source said. Three months ago, when area Christians distributed 50,000 gospel tracts and pastors from across southern India gathered, about 150 Hindu extremists surrounded them on a main thoroughfare in the Sirkali area. Police arrived and brought calm, Daniel Jebraj said. After five years in ministry, the church has seen Christians growing in numbers and breaking down caste-based barriers, he said. The latest attack, he said, was a setback for the community. The spate of attacks on minorities including Christians is not only worrisome but something that should make all citizens of this country sit up and take notice. Cow vigilantism and lynchings by mobs of goons as well as hate being manifested openly since the past few years are not acceptable, in a country that is supposedly secular and democratic. The Modi govt, if sincere about Sabka sat, sabka vikas, should immediately act to put a stop to these hate crimes.